JamVox AmplifierIf you are looking for a great hardware/software combination for less money, you can not go wrong with JamVOX. This is a great VOX amp that allows you to use GXT guitar Xtracktion technology. Not only that, but the software that comes with the JamVOX offers a very easy-to-use drag and drop system that even lets first time users import their very own MP3 library on the fly. This includes music that could be on your iTunes device or on a CD itself. 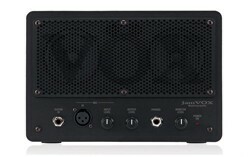 The great thing about the JamVOX is the GXT guitar Xtracktion technology that we talked about. With this you can very easily extract any kind of solo guitar or vocal part in any song. This even includes prerecord tracks. Not only that, but it has WAV and AIFF recording capabilities. Pretty much, that means that you are able to record your very own music over a track. This is the perfect tool for anyone that is looking to do some recording, practising, or just jamming out! This great combo offers you 19 modelled guitar amps. Not only that, but you get 54 modern and vintage effects, along with 12 cabinets. You should also note that it has many guitar pickup simulations as well. You will also find that all of the 100 plus preset programs have a great noise reduction feature as well. To cap it all off, all the programs that you make can be saved and shared online. The amp itself has two 3 inch speakers in it, as well as two bass reflex port holes. On the front of the amp you will find your XLR microphone input, as well as your guitar input. It has a headphone and a line output on the front as well. In the back, it has a number of things including a USB port and the foot switch port. All of this fits on a small 9.45”W x 6.3”D x 4.82”H box.